Preston Lingotot Centre | French and Spanish classes for kids. MFL PPA cover. Bonjour / Guten Tag / Hola/ Buongiorno! My name is Tasha and I live in Preston. I am wife to Dan and I have two sons who are 4 and 6 years old. I have had a love of languages since I was very young. My love of languages only increased when I began high school and was able to learn French and then Spanish. I loved both languages equally and didn’t want to give them up, so I studied both languages at Sixth Form and University. I studied French and Spanish with Italian Studies at degree level and then did my PGCE in French and Spanish once I graduated from University. I worked as a high school teacher before swapping this fast-paced job for family life. 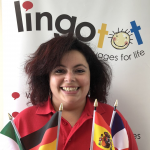 I returned to work in an International Export Office, where I was able to use my French, Spanish and German skills daily but my priorities are my children and my work-life balance, so I then discovered Lingotot! I love teaching all age groups and I have been a private tutor for a long time. I particularly love teaching children and watching them pick up and learn new words, sentences and songs. From my own experience teaching my children French it is a completely rewarding experience as it becomes second nature very quickly. I believe the younger the children learn a second or third language, the better. The ability to speak more than one language from a young age is amazing and a skill that can be maintained and carried into the future. Lingotot classes are packed full of interactive songs, games, stories, a craft and most importantly, they are fun! All of the sessions are conducted almost entirely in the target language and in our community classes, you learn alongside your children. Classes are suitable for babies, toddlers, young children and their parents/carers so that the whole family can enjoy learning a new language together. Lingotot Preston teach in community classes, but also in nurseries, KS1 and KS2 at Primary Schools (PPA) and afterschool clubs. Please do not hesitate to contact me should you have any questions at all about Lingotot.